Qatar Airways – your ultimate dream? Imagine yourself working for Qatar Airways as a Cabin Crew member. What a beautiful thought indeed. The state-owned flag carrier of Qatar is highly prestigious and is well known for its emphasis on high-quality in-flight standards. Together with Emirates and Etihad Airways, Qatar joins to complete what is known as the Big 3 Working for any of these Big three is an ultimate dream for too many young people around the world. But maybe before you submit your application at Qatar Airways you might want to know the following few things about the airline. Qatar Airways demands its crew to live under very strict curfew in monitored accommodation and restricts their movements so much that a lot of trainees quit before they even go halfway through the training. With Qatar Airways, it is forbidden to spend the night somewhere else. You have to stay on the airlines premises. Its a must. Qatar Airways makes it extremely difficult to envision having romantic relationships, especially with colleagues. The female crew cannot be driven to or from work by a man other than a ‘verified’ family member. This, the airline says, is for “compliance with a particular cultural norm in Qatar. “ Make a mistake of falling pregnant, you will be kicked out instantly like a dog and without compensation. This is actually a clause included in their contract. It is also forbidden to smoke and those wishing to hide cigarettes in their rooms should beware. Whilst you are away on flying duty, supervisors often times raid your room hunting for evidence of your smoking. Whatever happened to personal privacy? Once you sign that contract at the beginning of your training period, you become the airline`s personal possession. For example, to be able to leave the country during your well-deserved days off, you have to request the authorization of a supervisor. But take note, that approval does not come so easily. A supervisor retains the right to deny your request without any room for an appeal from you. 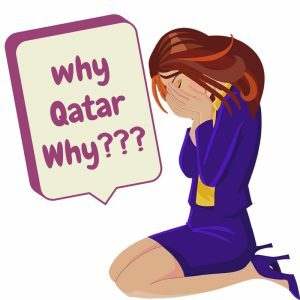 In spite of all these negative aspects about the airline, some industry experts argue that the benefits of working at Qatar far outweigh all the negatives about the airline. Qatar Airways has very attractive salary benefits for Cabin Crew. In fact, the airline`s aircrew makes between 2000 and 2500 euros monthly, net of taxes. All receive free housing in rather comfortable apartment buildings in Doha, with a pool and fitness centre. Their transportation fees and health insurance are fully covered too. Would you work at Qatar Airways? What`s your thought?